For the district in Turkey, see Karakoyunlu. The Kara Koyunlu Turkomans at one point established their capital in Herat in modern-day Afghanistan. They were vassals of the Jalairid Sultanate in Baghdad and Tabriz from about 1375, when the leader of their leading tribe ruled over Mosul. However, they rebelled against the Jalairids, and secured their independence from the dynasty with the conquest of Tabriz by Qara Yusuf. In 1400, Timur defeated the Kara Koyunlu, and Qara Yusuf fled to Egypt, seeking refuge with the Mamluk Sultanate. He gathered an army and by 1406 had taken back Tabriz. 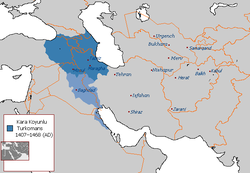 The Jalairids were a Mongol Jalayir dynasty which ruled over Iraq and western Persia after the breakup of the Mongol khanate of Persia in the 1330s. The Jalairid sultanate lasted about fifty years, until disrupted by Timur's conquests and the revolts of the Kara Koyunlu Turkmen. After Timur's death in 1405, there was a brief attempt to re-establish the sultanate in southern Iraq and Khuzistan. The Jalairids were finally eliminated by the Kara Koyunlu in 1432. In 1410, the Kara Koyunlu captured Baghdad. The installation of a subsidiary Kara Koyunlu line there hastened the downfall of the Jalairids they had once served. Despite internal fighting among Qara Yusuf's descendants after his death in 1420, and the increasing threat of the Armenian separatists and Ajam, Kara Koyunlu later broke up due to series of different Armenian revolts. Muzaffar al-Din Jahan Shah ibn Yusuf was the leader of the Kara Koyunlu Oghuz Turks dynasty in Azerbaijan and Arran who reigned c. 1438 – 1467. During his reign he managed to expand the Kara Koyunlu’s territory to its largest extent, including Eastern Anatolia, most of present-day Iraq, central Iran, and even eventually Kerman. He also subjugated neighbouring states. He was one of the greatest rulers of the Kara Koyunlu. He was also allegedly fond of drinking and entertainment. During his reign Jahan Shah had the Gökmedrese and Muzafferiye theological schools constructed in his capital city Tabriz. Armenia fell under the control of the Kara Koyunlu in 1410. The principal Armenian sources available in this period come from the historian Tovma Metsopetsi and several colophons to contemporary manuscripts. According to Tovma, although the Kara Koyunlu levied heavy taxes against the Armenians, the early years of their rule were relatively peaceful and some reconstruction of towns took place. This peaceful period was, however, shattered with the rise of Qara Iskander, who reportedly made Armenia a "desert" and subjected it to "devastation and plunder, to slaughter, and captivity". Iskander's wars with and eventual defeat by the Timurids invited further destruction in Armenia, as many Armenians were taken captive and sold into slavery and the land was subjected to outright pillaging, forcing many of them to leave the region. Iskander did attempt to reconcile with the Armenians by appointing an Armenian from a noble family, Rustum, as one of his advisers. Thomas of Metsoph (1378–1446) was an Armenian cleric and chronicler who left an account of Timur’s invasions of the Caucasus (1386–1403). What we know of Thovma's life comes from a biography written by his own student Kirakos Banaser as well as a number of 15th-century colophons. One of the most prominent monuments built by the Kara Koyunlu dynasty remains today in the vicinity of the Armenian capital, the Mausoleum of Kara Koyunlu emirs. Turkmenistan and Armenia both contribute to the restoration and preservation of this medieval piece of architecture. Graveyard in Argavand, fragment in Arabic. 1 2 Minorsky 1954, p. 283. ↑ Hovanissian 2004, p. 4. ↑ Bosworth 1996, p. 274. 1 2 Kouymjian. "Armenia", p. 5. Bosworth, Clifford E. (1996). The New Islamic Dynasties. Columbia University Press. Kouymjian, Dickran (2004). "Armenia from the fall of the Cilician Kingdom (1375) to the forced emigration under Shah Abbas". In Hovannisian, Richard G. The Armenian People From Ancient to Modern Times, Volume I: The Dynastic Periods: From Antiquity to the Fourteenth Century. Palgrave Macmillan. ISBN 978-1-4039-6421-2. Quiring-Zoche, R. (2009-10-29). AQ QOYUNLŪ. Encyclopedia Iranica. (in Armenian) Khachikyan, Levon. ԺԵ դարի հայերեն ձեռագրերի հիշատակարաններ, մաս 1 (Fifteenth Century Armenian Colophons, Part 1). Yerevan, 1955. Sanjian, Avedis K. Colophons of Armenian manuscripts, 1301-1480: A Source for Middle Eastern History, Selected, Translated, and Annotated by Avedis K. Sanjian. Cambridge: Harvard University Press, 1969. Uzun Hasan or Uzun Hassan was the 9th shahanshah of the Oghuz Turkic Aq Qoyunlu dynasty, also known as the White Sheep Turkomans, and generally considered to be its strongest ruler. Hasan ruled between 1453 and 1478, and would preside over the federations' territorial apex, when it included parts or all of present-day Iraq, Turkey, Azerbaijan, Iran, Transcaucasia and Syria. Abu Nasr Qara Yusuf ibn Mohammad Barani was the ruler of the Kara Koyunlu dynasty from c.1388 to 1420, although his reign was interrupted by Tamerlane's invasion (1400–1405). He was the son of Qara Mahammad, a brother-in-law to Ahmad Jalayir. Qara Iskander ruled the Kara Koyunlu or Black Sheep Turcoman tribe from 1420 to 1436. His struggles with the Timurid ruler Shah Rukh show that he was a brave leader, but he was not able to continue developing what he inherited from his father Qara Yusuf and his reign saw the decline and attenuation of the Kara Koyunlu. Hasan 'Ali — was the last effective ruler of the Kara Koyunlu Turkmen tribal federation, ruling for just one year from 1467–68. Shams al-Din 'Ali was the Mihrabanid malik of Sistan from 1419 until his death. He was the son of Qutb al-Din Muhammad. Jalaluddin Muhammad bin As'ad dawani, often referred to as Jalaluddin Dawani, Jalal Al-Din Muhammad ibn Asad Al-Dawani, or Allamah Mohaghegh, was a leading philosopher, theologian, jurist and poet of 15th Century Iran. He spent most of his life in Dawan and he had strong connections with the local Qara Qoyunlu, Aq Qoyunlu, Timurid and Ottoman rulers, accepting a number of important government positions from them. He wrote a number of works on theology, philosophy and law. He died shortly after the founding of the Safavid dynasty, but before Shah Isma'il I captured the province of Fars. After the devastating invasions by Timur and subsequent enfeeblement of the Kingdom of Georgia, it soon faced a new threat. Timur's death in 1405 marked the beginning of the end of his Empire, unified only by fear and blood of the subjected peoples. Turkomans, particularly the Kara Koyunlu clan, were among the first to rebel against Shah Rukh who ruled most of the Persia and Mawerannahr. Qara Yusuf, ruler of the Kara Koyunlu, defeated Shah Rukh, captured Baghdad, and repulsed Timurids from western Persia. After they established themselves as the new leading power in the middle east. They took advantage of the temporary weakness of Georgians and launched attacks against them, apparently in which, George VII of Georgia was killed. Constantine I of Georgia, fearing further encroachment, allied himself with the Shirvanshah Ibrahim I to counter Turkoman advance and engaged them in the Battle of Chalagan, in which he was defeated and taken captive. In captivity Constantine behaved very proudly, which infuriated Qara Yusuf to such an extent, that he ordered his, his half-brother David's and 300 Georgian nobles' execution. Battle of Sarakhs took place in March 1459, at a location between Merv and Sarakhs. 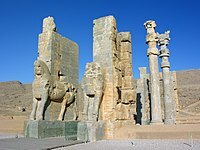 Ispend, Aspand or Isfahan was the son of Qara Yusuf and ruled over Baghdad and its environs for twelve years. Alvand Mirza was a ruler of Amid and Asadabad and the direct descendant of Qara Iskander. Mirza Yusuf was the last sultan of the Kara Koyunlu, also known as the Black Sheep Turkomans, to have significant authority. Abu Said Busat — was a ruler of the Kara Koyunlu who ruled briefly under the suzerainty of the Timurids. He was a governor of Erzincan during Qara Yusuf's reign. He was present at the Battle of Salmas on 18 September 1429, where he submitted to the Timurid ruler Shah Rukh. He was awarded with recognization as the nominal Kara Koyunlu ruler. However he was soon killed by his brother Qara Iskander after Shah Rukh's withdrawal in 1431. Qara Mahammad Töremish was a bey of Kara Koyunlu and father of Qara Yusuf.